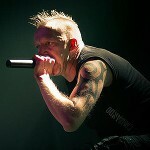 Suicide Commando will return to Das Bunker in Los Angeles on April 27 with Aesthetic Perfection and Youth Code. Johan van Roy of Suicide Commando wrote to the public, “Yep yep, Los Angeles, we’ll be back to take revenge for our fucked up show last year!” The front man was attacked onstage last year at Das Bunker by an angry sound technician after van Roy criticized the live audio issues to the public. Tickets are available in person at Das Bunker, Mount Analog, Vacation Vinyl, and Doomi’s Home Cookin’ and online via Flavorus.com.